There are a lot of ways to market a business; and with constrained time and assets, it’s difficult to figure out which ones are worth seeking after. The fact about email marketing campaigns is that Google search algorithms change, social networks come and go, but people will always check their email. 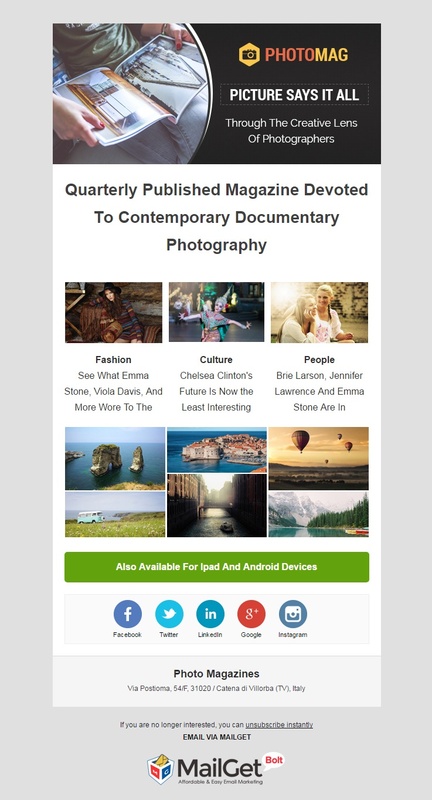 An email campaign enables photographers to remain in contact with prospects. Announce print sales, remind clients of holiday portraits & update them on the latest happenings at your photography studios. But the question is why use an email marketing service when you can just send from your email address? Easy design -> Drag-n-Drop builders with no hectics of HTML & CSS. Advanced stats & reports -> The opening/clicking/withdrawal rates will help in decision making. Automated process -> Autoresponders, drip emails for latest photo shoots provides an easy going path. Here in this list post, we’ve narrowed down 9+ best photographer email marketing services for photo studios, film & fashion photographers crafted with all the above functionalities, which are a part of MailGet Bolt – Email Marketing Software. Having a design photography business is insufficient to grow the business, you have to advertise your portfolio skills and this can be effortlessly done by email marketing. 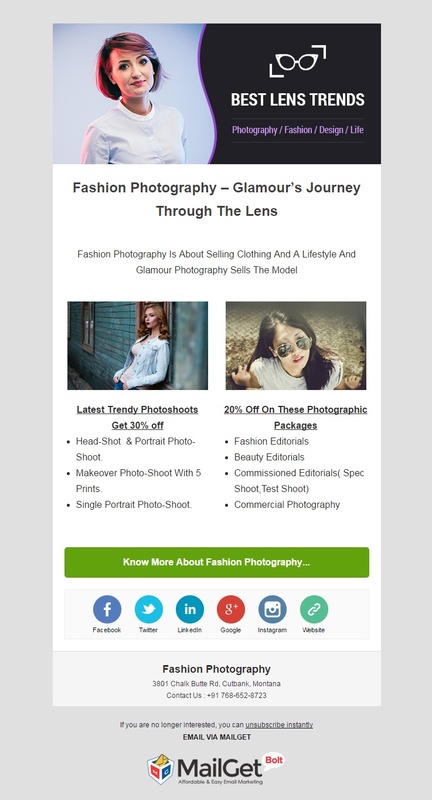 This email marketing service for fashion photographers enables to create emails with the handy email builder tool, send them to a bulk of subscribers. Keep a track of the sent emails, as this will help you to analyze what works best for the portfolio clients. The dashboard displays data about email opening, unopened & clicked email rates. This email marketing software confirms a high inbox email delivery rate. Use drip email campaigns to send fashion photography emails automatically at set time & date. One of the prime features of this tool is that it offers a free library of pre-built theme templates. Professional photographers & photo studios are still in great demand, but to publicize it they just need a top-class service. This email marketing solution comes with a very interactive dashboard, which gives all the control of email designing to tracking them regularly. Collect unlimited leads by embedding email signup forms on high-profile websites. And let this tool manage the contacts with the effective list management feature. Engage maximum users with your photography emails by ensuring that emails are delivered right to the inbox. Schedule the emails to be sent at a particular time & date when the recipient is most likely to engage. Build the reputation of studio emails by sending emails with personalized names of the user. 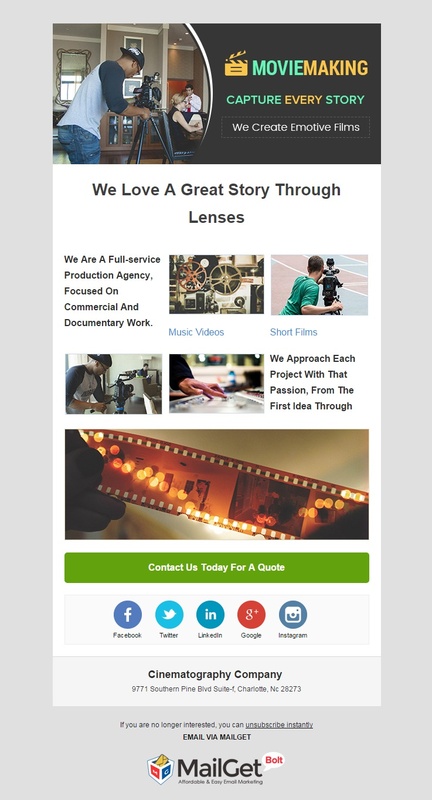 Promote your innovative filmmaking skills among a wider audience by sending them emails featuring your expertise. This email marketing service will help you to do so & you can also track the results on a real time basis. This software also empowers you to send emails with personalized tags, as this increases the chances of email opening & customer conversion. Use the drip emailing feature to automatically send a series of emails informing the clients about filmmaking in a systematic manner. Add pictures, social icons, buttons & an unsubscribe handle in the email templates. You can view the emails before sending them with the email inbox preview option. 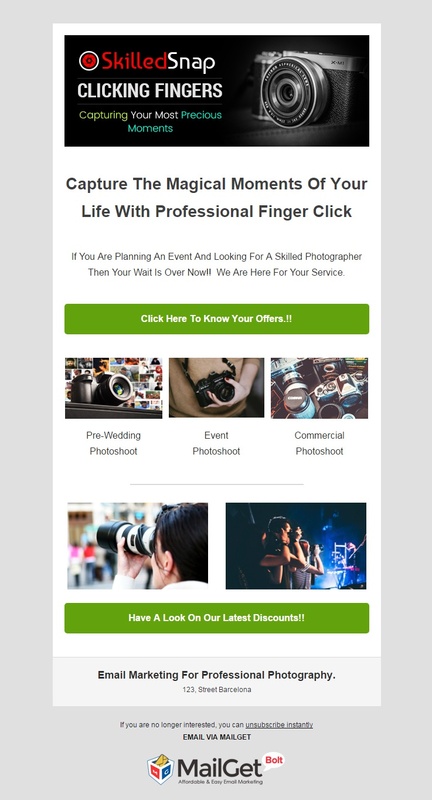 Grab more assignments for your wedding photography studio by sending attractive emails starring the shooting skills to thousands of potential clients using this email marketing software. The auto-follow-up feature will automatically send emails to those who have not opened emails for the first time. The dashboard displays all the stats regarding the sent emails & the contacts tab can be used to view the list of subscribed, unsubscribed & bounced email ids. 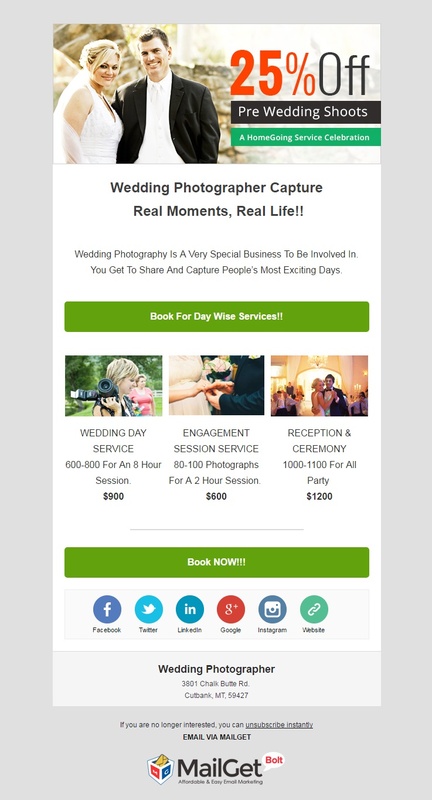 To absorb more clients for your wedding photographers agency send emails with personalized tags. Segment your contacts according to their portfolio requisites & send them only targeted emails. The autoresponder emails can be used to build a healthy communication with the user right from the beginning. 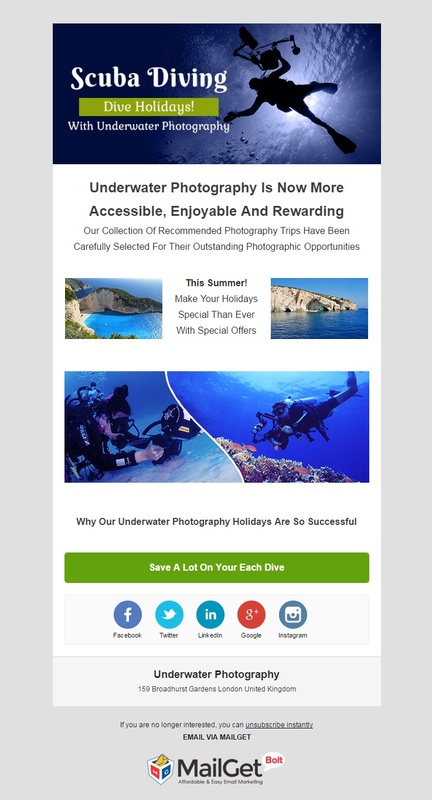 With this outstanding email marketing service, advertise underwater photography skills, share customers’ experience, give a virtual tour of the scuba photography club by sending emails. Analyze the behavior of the users towards the sent emails with the track reports of the sent emails displayed on the dashboard. Preview the emails & rectify any errors before hitting the send button. Segment the contacts according to their photo interests & send them related emails to get a maximum conversion. This email marketing software offers a powerful list management service to help scuba diving photographers easily handle huge database. Look after the sent email campaigns & analyze their performance to revise your messaging style. Send posters with catchy taglines photos of your nature photography expertise via emails & draw maximum attention with this email marketing service. With the advanced features, you can easily design emails according to the nature shoot agency. This responsive email marketing tool fits into any screen & device, thus expanding your reach. The autoresponder & drip email campaigns are a perfect mode to automate the whole process of email delivery. Easily maintain well-segmented lists of contacts to ensure a maximum response from the subscribers. The email marketing tool provides you complete access to email templates designing & editing. With the Google analytics feature follow how many of the sent emails have been opened, clicked or unopened. Make the most out of this email marketing software that allows creating magnificent emails to make an instant impact on the recipient. Feature pictures of your shoots, taglines & powerful buttons to give the users an idea about professional photography. Build a well-maintained list of users by importing the contacts manually or add a CSV file. This tool provides an efficient list segmentation feature for grouping the users according to their photography interests. This email marketing software allows sending emails automatically by the autoresponder & drip emailing function. Promote the specialties of your photo studios via emails with multimedia options or else you can choose from a free collection of theme templates. To ensure a maximum response from the user, send the emails with the personalized tags. Draw more & more people to your photo exhibition & art galleries by sending them emails about the unique collection, artists & painters. You can set a desired time & date for delivering these emails with the help of drip & autoresponder emails. Maintain a long-term connectivity with art lovers with the auto-follow-up emails, which resends the same emails to those who haven’t responded for the first time. Regularly track the user’s behavior towards the sent emails to update your messaging style. 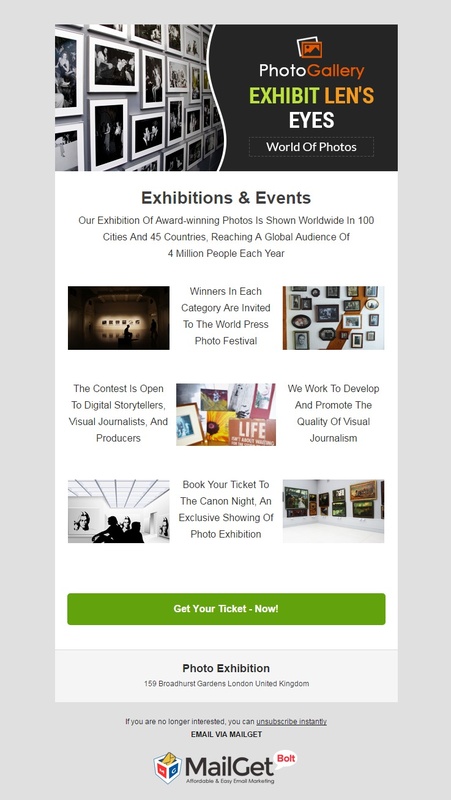 This email marketing tool promises that your art galleries promotional emails are sent straight to the recipients’ inbox. Without any difficulty grow the list of subscribers by embedding email sign-up forms on high-traffic websites. The contacts tab on the dashboard displays the list of subscribed, registered & bounced email ids. 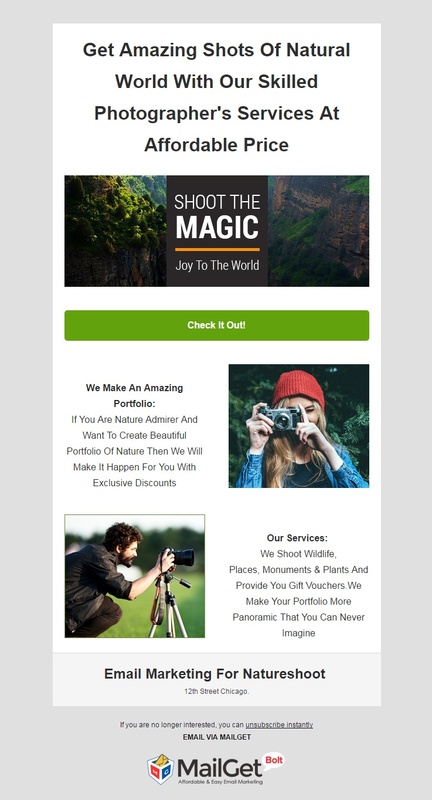 This email marketing service is a cost-effective mode to send bulk emails and advertise your wildlife photography worldwide. Sending bulk emails through this software is snappier & easier than any other. Schedule the animal photography related emails to be sent later at a time when the users are most likely to engage with it. Design captivating emails with wildlife pictures, social media icons to connect with the subscribers on other networks & you can also provide an unsubscribe handle in the message body. 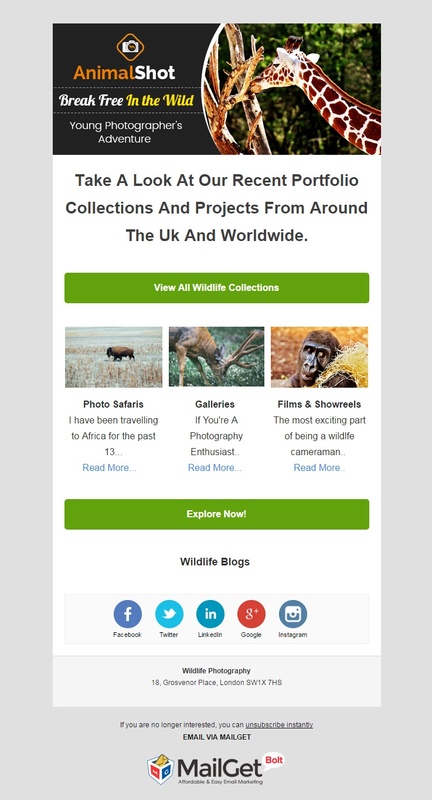 Stay in touch with the wildlife lovers by sending them newsletters about your upcoming projects via drip emails. Utilize the email marketing personalization option to give a sense of recognition to recipients. Designing of email templates was never so easy, by just dragging & dropping the content fields. The email marketing service can be utilized to convey bulk messages to the huge population, whom you wish to draw in your photograph magazine business. There are numerous elements through which an email can be customized. Portray the elements of photography magazine & you can also resend the same emails to those who haven’t opened emails for the first time. Develop a well-segmented list of subscribers as this will help you manage a vast of subscribers. The integrated email tracking analytics will help you understand the email opening/unopened/clicked rates. This affordable email marketing service is a perfect choice for fashion magazines, vogue journals to promote their profession via emails. The clue with email marketing is to get a right balance between ‘promotional’ emails and emails that people genuinely find useful and interesting in some way. I’d mention that displaying work, telling stories and giving clients tips/advice should probably make up the bulk emails more noteworthy. 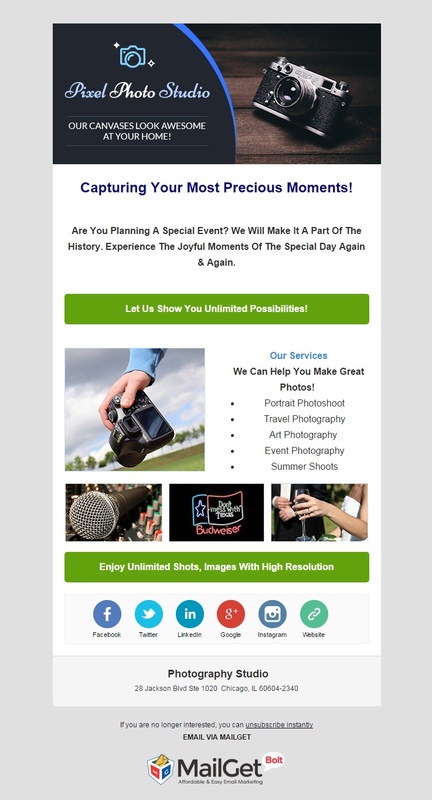 This collection of email marketing solution providers is bound to give your photography vocation a cutting-edge promotional track. They are based on the foundation of a dynamic software – MailGet Bolt. Want to explore it on your own? Looking for email marketing tool for other business niches? Then you can find a suitable one from our huge compilation of multi-purpose email marketing services.